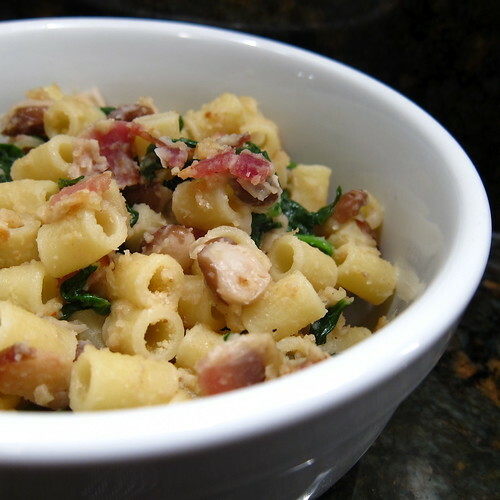 Here's a pasta that full of stuff that's good for you, leafy greens & beans, plus has tasty, salty bacon pieces. Other than cooking the beans this is a super fast dinner. You could used canned beans but then you wouldn't have the flavorful cooking water to add to the pasta. I recently got a small crock pot at Target for $7 & it's the perfect size for cooking beans. I let them soak for about an hour or so then set the crock pot to low & let the beans cook for about 4 hours. I had perfectly cooked beans with no fuss. My bean were so creamy they added an almost sauce-like texture to the finished dish. Cook the pasta according to the directions. Drain when al dente. Meanwhile, cook the bacon over medium-high heat until crispy. Remove from pan & drain on a paper towel. Add olive oil to the pan & heat. Add the garlic & cook for about a minute. Pour in a little of the reserved bean liquid & stir scraping any brown bits from the bottom of the pan. Put the spinach in the pan & cook until just wilting. Add the beans, bacon & pasta & mix together. Stir in the remaining bean water. Add the red pepper flakes, bread crumbs & Parmesan. Season with salt. a really nice dish. my wife has been on a pasta with spinach kick recently so she would really appreciate this. love the addition of bacon!!! I almost expected to see butter or a bit of cream in the ingredients list but it's all reserved cooking liquid from the beans? Maybe that gives me a bit of room to add extra bacon . . . I usually use canned beans but uncooked is so much less expensive (not to mention more varied); I've been toying with the idea of pressure cookers but first, I'll try your crock pot method! Bacon. BACON! As the comedian Jim Gaffigan says: "If you ever wrapped bacon in bacon, you would fall into a tasty vortex." ha ha I love what grace said above. very cute. My mum and I ate pasta with spinach and bacon about once a week for all my teen years - and I still love it. Adding beans is a really great idea. What brand of small crock pot did you get? Last one I had cooked at too high a temp to do many typical slow cooked items. Mary - The little one I used to cook the beans is a Chef Mate from Target. Our big one that I use most of the time is a Rival. Love all the ingredients in this pasta! I am starting to love spinach in pasta so I will have to try this one soon. Thank you! This is our kind of pasta!!! I've been sneaking spinach into pasta sauces... Austin doesn't notice!!! I would live on pasta if hubbyld let me. This sounds rally good, I'll have to try and sneak the beans in without him noticing!! I never do dry beans, but this makes me want to try! Love home cooked beans -- and pairing them with pasta is such a great idea. Haven't done that in a while, but definitely should get to it! What size is your little crockpot? This looks great! I have all of the ingredients in my pantry already. Can't wait to try it! I adore this small, tubed pasta and we have this shape in Greek cuisine too! A warming bowl of pasta...love the beans and pork. What a wondeful weeknight dinner. I love the idea of a small crockpot for cooking beans! I've been trying to cook all my own beans instead of using canned, but it's time consuming. You have the perfect solution. Pasta with Spinach, Beans & Bacon are good for one meal. I love the tube pastas, it is like a macaroni pasta with bacon. Incredible meal and good meal for the family. This would be a full meal for me.